It's like this, but different. Thrill Digger is a minigame included in The Legend of Zelda: Skyward Sword. It is a minesweeper-esque game in that there are hazards scattered around a grid and the spots in the grid that don't contain a hazard give a clue as to how many hazards surround that spot on the grid. In minesweeper, there are bombs and numbers. A number tells you how many bombs are in the eight squares around the number. The board starts off with none of the squares revealed. Each click reveals a square's contents. Clicking on a bomb ends the game with a loss. To win the game you must reveal every non-bomb square. Versions of the game allow you to plant a flag on spots to mark them as containing a bomb so you don't make a mistake later. Rupoors - A black rupee. You lose 20 rupees. These do not end the game. Rupees - These indicate how many bombs surround that square and give you rupees. Green - Indicates there are zero hazards in the surrounding squares and gives you 1 rupee. Blue - Indicates there are one or two hazards in the surrounding squares and gives you 5 rupees. Red - Indicates there are three or four hazards in the surrounding squares and gives you 20 rupees. Silver - Indicates there are five or six hazards in the surrounding squares and gives you 100 rupees. Gold - Indicates there are seven or eight hazards in the surrounding squares and gives you 300 rupees. 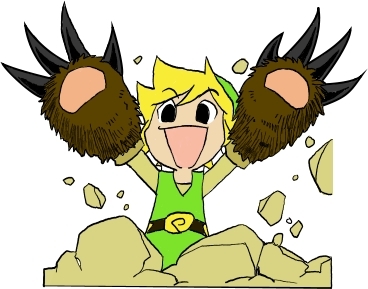 The goal is to collect as many rupees before you hit a bomb. In this game it is very hard to complete a board, and you aren't necessarily supposed to. The reason that it's so hard is because the rupees don't tell you exactly how many hazards surround them. That uncertainty greatly increases the difficulty. If you do manage to complete a board, you're rewarded with a high-quality crafting material. There are three difficulties. Beginner costs 30 rupees to play. It is a 4x5 grid with 4 bombs and no rupoors. Intermediate costs 50 rupees and is 6x5 with 4 bombs and 4 rupoors. Expert costs 70 rupees is 8x5 with 8 bombs and 8 rupoors. So a particular play is a win if you dig up more rupees than you put into the game. I personally find intermediate to be the easiest to complete. There's a very good reason for this. Consider this chart. Intermediate is the easiest to complete for me because it has the lowest percentage of bombs. There are more hazards overall, but they're less likely to end the game. I'm completely in love with this game, even though I really don't like how the game doesn't keep a reminder what was dug up in a particular spot. I can't play intermediate or expert for very long without needing graph paper on which to chart my progress. Despite that, I've played it incessantly. Oh, and by the way, if you think this is all that I have to say about this super awesome minigame, you're wrong. I have much more to come, including strategies and much much more.